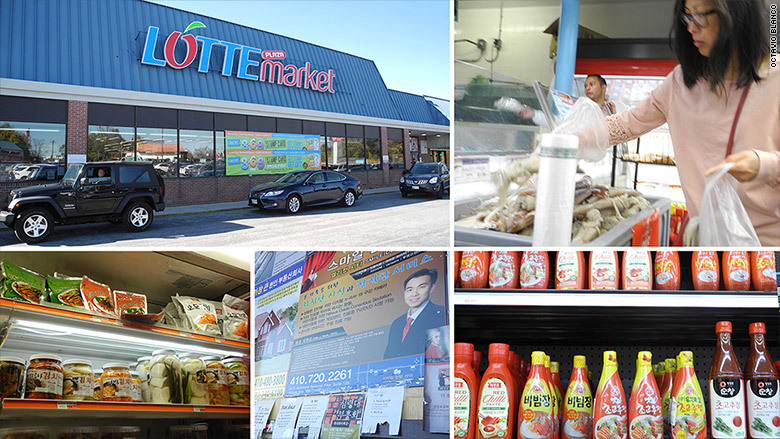 The Korean-owned Lotte Plaza Market in Ellicott City offers aisle upon aisle of fresh produce and seafood, as well as Korean staples like kimchi, rice cakes and spicy dried squid. Less than a decade ago, the 10 mile stretch of Route 40 that runs through Ellicott City, Maryland was a succession of sleepy shopping plazas, car dealerships and ranch-style homes. But these days, it looks more like a thriving suburb of Seoul, Korea. In the Golden Triangle shopping center, the gigantic Korean-owned Lotte Plaza Market offers aisle upon aisle of fresh produce and seafood, as well as Korean staples like kimchi, rice cakes and spicy dried squid. Further down Route 40, there are Korean barbecue and noodle restaurants, as well as all sorts of businesses boasting the latest deals in both English and Korean. The Asian population in Ellicott City ballooned to 23% in 2013, according to the latest U.S. Census Bureau statistics. That's compared to 5.5% in the rest of the state of Maryland. And just over 7% of Ellicott City's nearly 66,000 residents are Korean, making it one of the most densely Korean populated towns in the entire state. One of the reasons so many Koreans are now calling Ellicott City home: the public schools, which have long been considered among the best in the nation. "Schools received calls all the way from South Korea inquiring about school boundary lines," said Daraius Irani, chief economist at the Towson University's Regional Economic Studies Institute. "[They] wanted to know where to buy homes to send their kids to the best schools." A medical office in Ellicott City, Maryland. But not all of the new arrivals come straight from Korea. For many, moving to Ellicott City is the next step in realizing their American Dream. "Most of the people that are here came to the U.S. in the '70s and '80s and their kids were born here," said Charlie Sung, an attorney who is also the leader of the Howard County Korean American Community Association. The majority of immigrants who arrived during those years were working class and moved to cities like Baltimore to find jobs or start their own businesses. 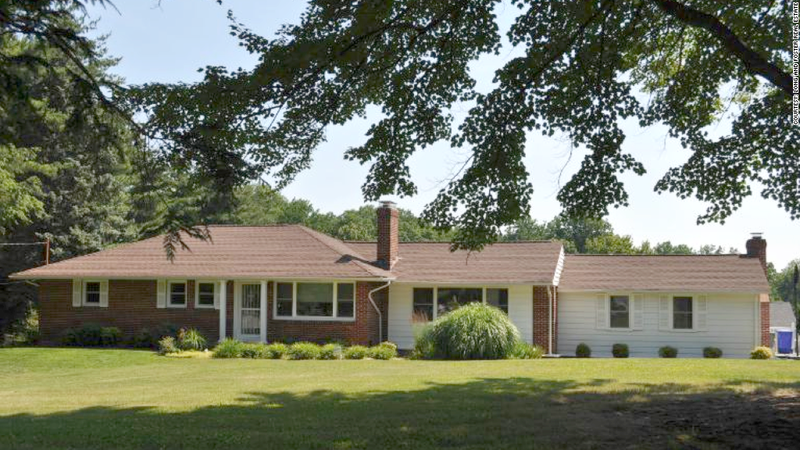 After years of hard work, families who have established themselves financially sought to move out to the suburbs, seeking bigger homes and better educations for their children. "Education is number one for the Korean population," said Sung. "It really is the focus of every family, so there has been a lot of movement of folks from other parts of the state and other parts of the country." Many businesses along Route 40 advertise in both English and Korean, including this gas station. Ellicott City's Centennial High School, for example, consistently ranks near the top of U.S. News and World Report's "Best High Schools" list. During the years of the biggest influx of Koreans to the area, it was ranked #1 in the nation. The school has since fallen in the ranks, but it is still a top contender with nearly 60% of students ranking as "advanced" in Algebra and English. And it's diverse, with a student body that is 52% white, 32% Asian, 7% black and 4% Hispanic. 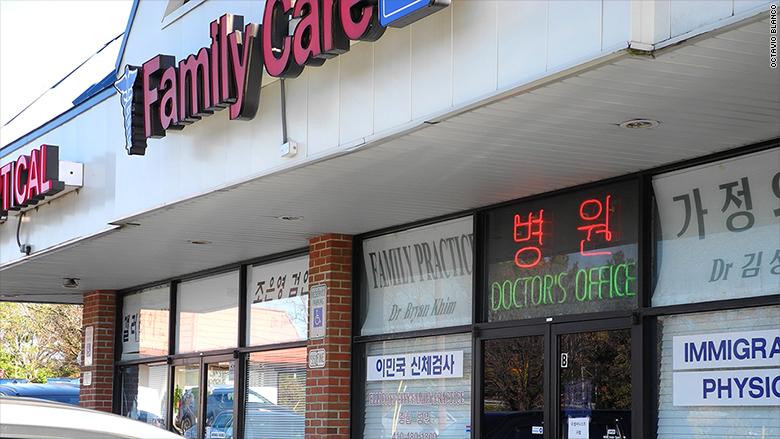 Such diversity is another reason why Korean families have sought out Ellicott City and the neighboring city of Columbia, said David Lee, director of constituent services for Howard County executive Allan Kittelman. Columbia was one of the first planned communities in the U.S. with a long history of inclusion and acceptance of minorities. "The culture of Howard County is welcoming from its very origin," said Lee. Founder James Rouse built up the community with a focus on diversity, offering housing, parks and free public education for families of various socioeconomic backgrounds. Ellicott City used to be dotted with ranch-style homes. 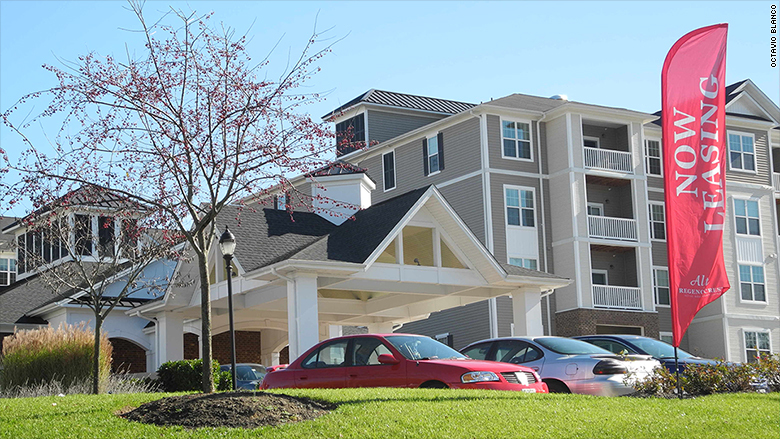 Now, there's an apartment building for active retirees where a single-family home used to sit. "When your main corridor changes to this extent, to where almost every sign is in Korean, and to accept that as something that's good rather than something you're fearful of and suspicious of is a very unique thing about Howard County," said Sung. "I think it says a lot about the folks that live here and have grown up here." For Ellicott City, the Koreans came at a really good time. The influx started to gain momentum in 2008, just as the U.S. housing market was starting to melt down. 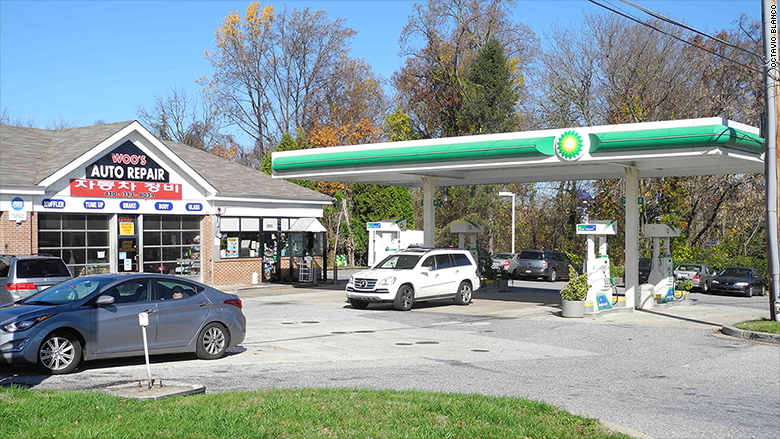 "While the area is pretty insulated from drastic economic shifts because of nearby government jobs, it was able to skirt the worst effects of the meltdown, in part, due to so many newcomers buying homes here," said Irani, the Towson University economist. The median household value in Howard County is $425,000 -- more than one and a half times the median home price in Maryland and more than double the median value of homes nationwide, according to the latest Census figures. Korean residents have also helped reinvigorate the business community and brought new life to the area's once ailing strip malls. "They're entrepreneurial and they're engaged," said Vernon Thompson, executive vice president of Howard County's Economic Development Authority. In Howard County, 13.5% of businesses are now Asian owned. That's double the percentage of Asian owned businesses in the rest of Maryland, said Irani, citing research conducted by the Regional Economic Studies Institute at Towson University. In fact, there are so many new Korean businesses, that a Korean small business development office is being created to offer training and mentoring to new owners, said Thompson. Irani, who was born in England, has lived in Ellicott City with his wife for the past eight years and says he loves the way the community has changed. "It's gotten more diverse. We now have many Asian and Korean markets," he said. "As an immigrant, myself, I think it's great."